solar-powered with battery backup prevents memory loss. Twin-power source: built-in solar cell (more than approx. 50 lux) or lithium cell (less than approx. 50 lux). 12-digit liquid crystal display with automatic 3-digit punctuation. independently accessible 4-key memory plus second 2-key memory function, round up/off/down, add mode, fixed (3,2,0)/ floating decimal, Constant and Sigma mode selectors, adjustable stand and carrying case. 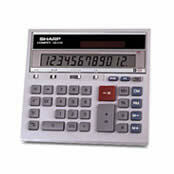 This page is part of GeneralManual.Com Network SHARP QS-2130 Commercial Calculator User Manual.